Galia was invited by Romans. The druid Priestess, Norma, had two children with Pollione, Roman procónsul that made him fail her vow of chastity. Now her people ask Norma to declare war against the invaders and her love prevents her to do so. Altough, to her back, Pollione fell in love with Adalgisa. 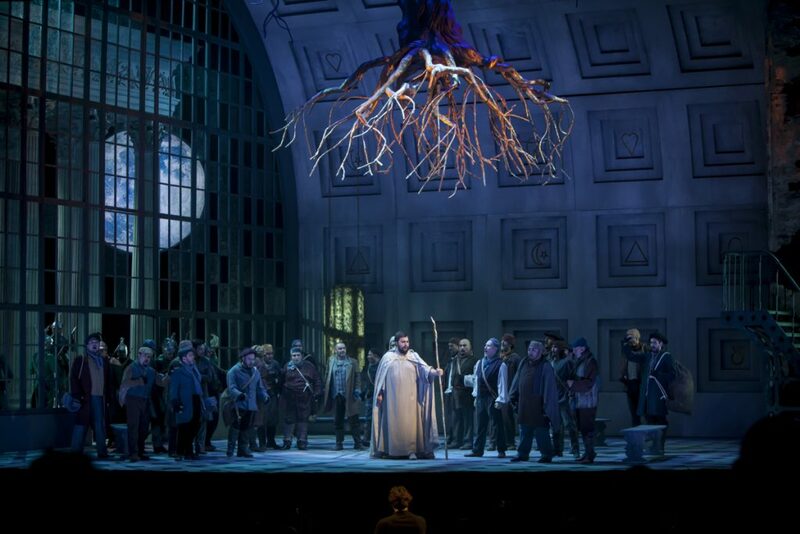 Shortly after beginning the function of Norma, the aria “Casta diva” – the most well-known piece of this opera – destroys any doubt that the viewer may have, because of the superb interpretation that Irina Churilova makes of Bellini’s composition, which It causes a wave of applause before the first drop of the curtain, predisposing the audience to enjoy the rest of the work.The vocal quality of the singers shines in the duets of Norma and Adalgisa (Churilova and Sekerina). 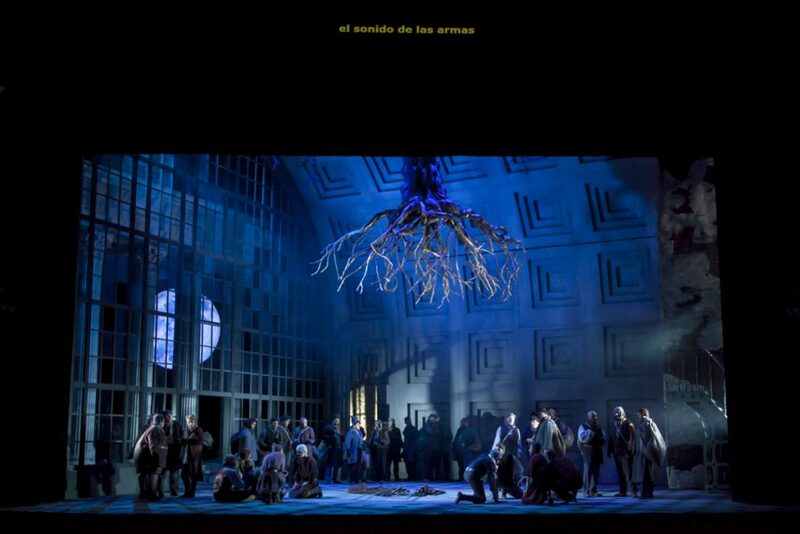 , during 2016, he hit the two sopranos who play the main roles, because in Norma, Pollione, the roman who causes the heroine’s happiness and misfortune, does not steal the protagonism as it usually happens in tragedies. talk about the story, let’s talk about the staging. It is the resistance of the indigenous against colonists, which seems to be a parallel with the Chilean reality in which only the way in which this realization should be read should be read, somewhere in the south of Chile there is a Norma with a Mapuche surname. 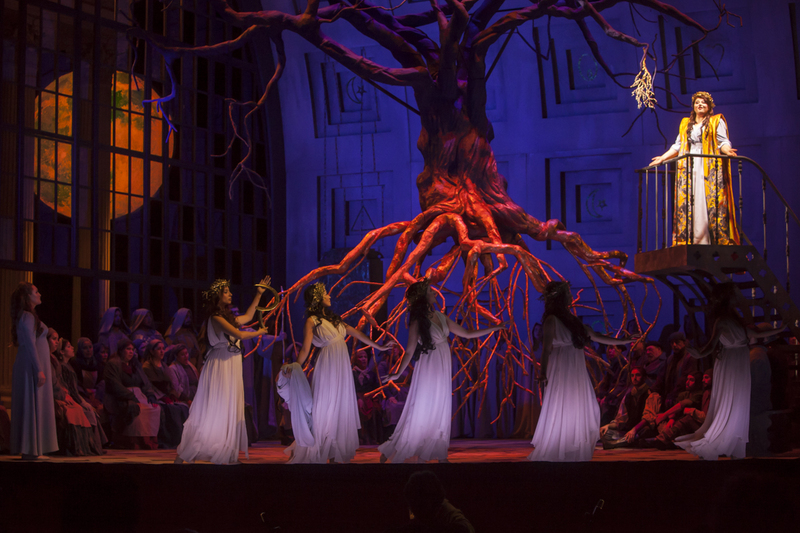 Irminsul, the large tree hanging from the center of the stage, is the reason for a rite of enormous beauty, simple but significant, that accommodates a great stage display where the choir goes to the religious festival waiting for the oracle, Norma, to give them the approval to declare war on the Roman occupation forces. The conflict between Gauls and the Roman invaders shows scenes of territorial occupation that make empathize with the people who live peacefully, whose only weapons are the tools to till the land and who still oppose the Roman swords. It is the resistance of the indigenous against settlers, it is the irony that can be observed when realizing that these realities are also lived in our time, in very different temporalities and space, is not the south of Chile, a space of indigenous resistance against settlers at this time? The anachronisms, objects out of place in history, clothing highlights the actuality of the conflict to detach from the classical era and adopt Victorian aesthetics, most of the clothing takes its inspiration from the nineteenth century, this is how we have soldiers who wear military uniforms modern court with Roman classical helmets, or that the villagers of Gaul dress as next villagers to face the first industrial revolution (another form of colonization), even though the conflict on stage takes place almost 50 years of Christ. The modern window of the Irminsul temple reveals the Roman columns of the nearby building. A game of time that emphasizes that Norma passed and, at the same time, is perpetuated in space as an eternal figure that is able to smile at his tragic destiny. At the beginning of the second act we see Norma in her room, in the bed her two children sleep peacefully, without imagining that the pillow in the hands of her mother will be used to try to suffocate them. Is that his mind is tormented by the desire for revenge of the man who has been able to seduce another priestess and not only has stopped loving her, but also corrupted Adalgisa, another of the devotees of Irminsul. Norma is between the love for the father of her children, Pollione, and her duty as priestess, daughter of the great druid Oroveso; between spite and his love as a mother; between his revenge and the guilt of having sinned. Norma decides. From several fronts Norma’s tragedy takes shape and meaning. The priestess has everything against her, the only thing they have in their favor is their love, immeasurable love that does not allow her to unleash a bloodbath. She is not the parricidal Medea, raging and cursing all those who caused her pain by betraying her, it is Norma, who prefers to confess her own faults rather than retaliate with the young Adalgisa, whom she does not blame for falling in love with Pollione. In her recent visit to the University of Santiago the philosopher Silvia Federici said that the best response of women to the aggressions of their environment towards women themselves -and by extension to men- is to strengthen the social fabric. Norma’s immolation points to this, she values ​​the way in which her sacrifice can maintain the tradition of her people to punish the priestesses who break their vows and, in addition, when she surrenders herself as Pollione’s lover and silences Adalgisa, she also lectures to the spectators on the limits of a passionate revenge. Pollione thus understands it and admires it. This admiration is reason for rejoicing for Norma. The walk to the bonfire has a similarity to the Sisyphus walk downhill, smiling because he got away with it. By making sense of his pain, he demonstrates a timeless dignity. The function concludes with an applause full of bravo, bravo! Shouts that give an account of how deep it was in the audience of the Municipal Theater the solid musical display they witnessed.